Throughout the years since I became a plant-based eater, I have tried a variety of the kind of “diets” within this community, primarily to lose weight. First, I discovered Dr. McDougall, who recommends that you base your diet on starch and little fat (if you want to lose weight). 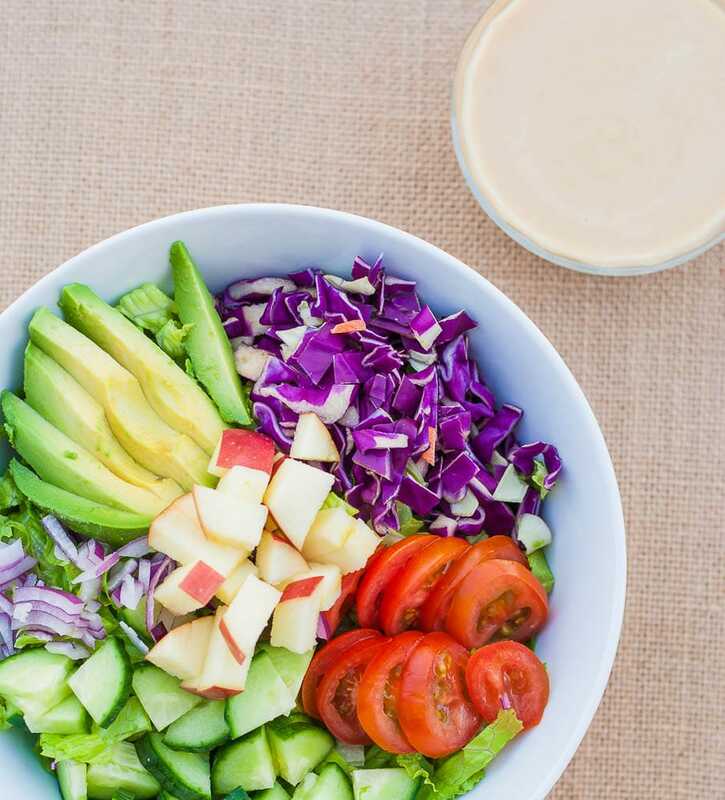 Then, I found Eat to Live and Dr. Furhman, who pushes a “nutritarian” diet, with loads of vegetables, a little bit of nuts, seeds, avocados, lots of beans and less starchy foods for weight loss. It has been a sort of food journey for me up until now, and honestly is still in process. I have learned a lot; about food, phytonutrients, and what seems to make my body (and mind) the happiest. Really, I’ve gotten a lot of good out of both the doctors mentioned above! I don’t know if I would have fallen in love with vegetables and huge salads if I hadn’t read Eat to Live, among Dr. Furhman’s other books as well. And I’ve found out how starchy foods (like potatoes, brown rice, pasta, etc) are SO satisfying. I enjoy them in my diet and do not fear them as fattening foods. What I have been reflecting on lately though, is that this plant-based lifestyle is just that; a lifestyle. A way of eating for life. It’s not a “diet”. It’s not a plan that you will do for a certain amount of time, lose some weight, and then stop the diet and go back to old habits. Maybe some people need a good kickstart, like Dr. Furhman’s 6 Week Challenge, but for the most part, research shows that diets don’t work long term. If what you eat is difficult to maintain, and causes you a lot of stress, it’s unlikely to last. Instead of thinking about what you have to cut out by adopting a plant-based diet, focus on what you get to eat in abundance. I enjoy food more than I ever did before. It has so much more flavor! 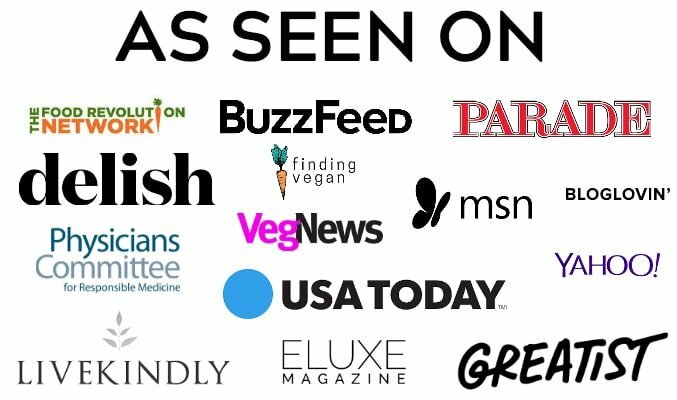 If you are new to a plant-based diet, or you’ve been around awhile, I hope this list will help you along in your journey. Happy eating! 1. 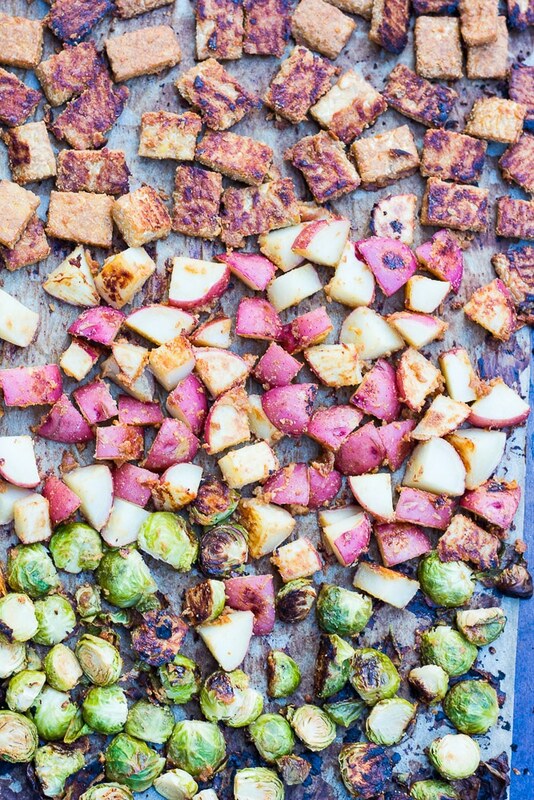 Roast vegetables often, and cook them in all sorts of delicious ways! Cauliflower, broccoli, brussels sprouts, bell peppers, red onions, sweet potatoes, squash and carrots are all so yummy when roasted! Put them on some parchment paper or a silicone mat, spray with a tiny bit of oil, water or vegetable broth, season with dried herbs and roast until done. Enjoy other vegetables in delicious ways all the time. Don’t settle for mushy green beans or force yourself to eat vegetables in ways that don’t taste good! 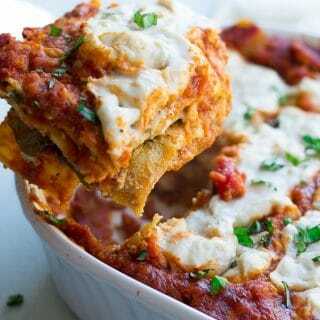 Learn how to cook veggies so they are mouthwatering. 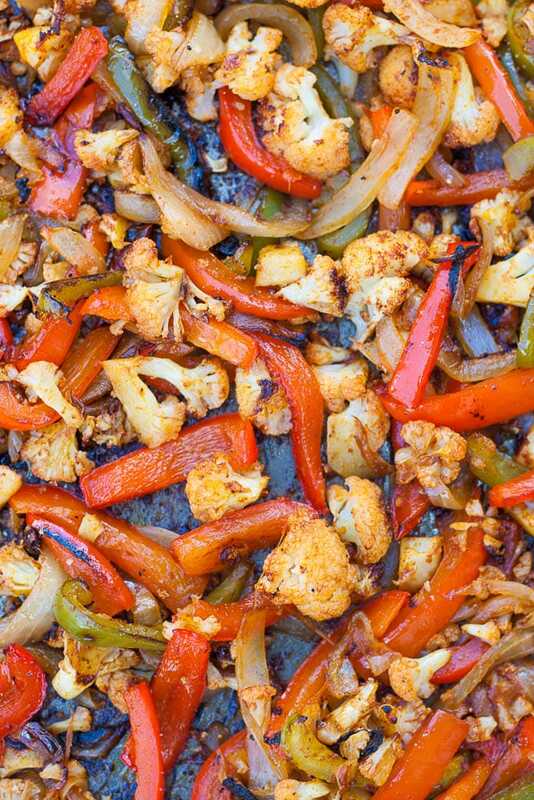 Vegetables really shine in so many of my vegan recipes, such as these Sheet Pan Cauliflower Fajitas, this Roasted Vegetable Enchilada Casserole. 2. Eat beans every day. Beans are so good for you, and if you are vegan they are an excellent and affordable source of protein. Not to mention they are so tasty! Beans are high in fiber and have all sorts of good-for-you nutrients. They improve blood sugar regulation and insulin levels, and fight cancer! Read more about this here. Choose from a wide variety such as chickpeas (aka garbanzo beans), black beans, refried beans, pinto beans, green lentils, red lentils. Add some to your salad, eat a bean/lentil soup or chili, or make bean burgers or a Vegan Meatloaf. Or have some spaghetti and these Chickpea Meatballs. The possibilities are endless! 3. Eat whole grains and starchy vegetables to feel satisfied. Don’t try to live on vegetables alone! This is not a diet for the birds. 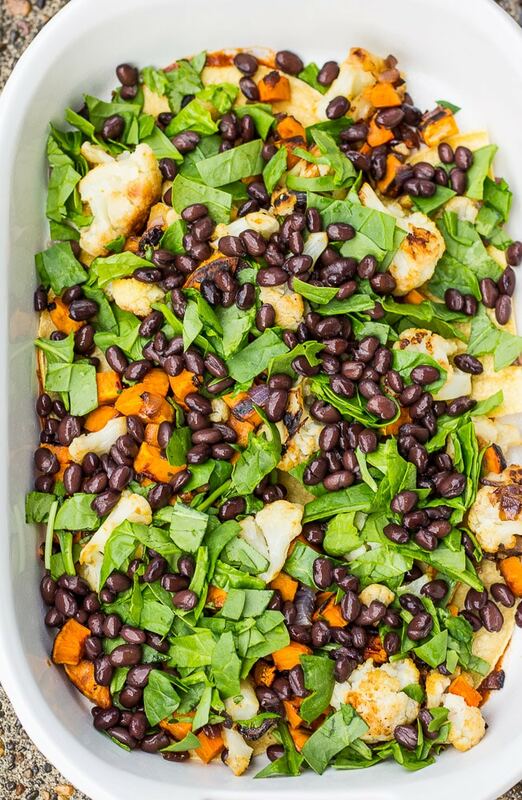 🙂 You can eat hearty, satisfying plant-based meals with the help of whole grains and starches. Find your favorites. I like sweet potatoes, yukon gold potatoes, butternut squash, brown rice, farro, oatmeal, whole grain pasta, buckwheat soba noodles like in these Teriyaki Noodle Bowls. 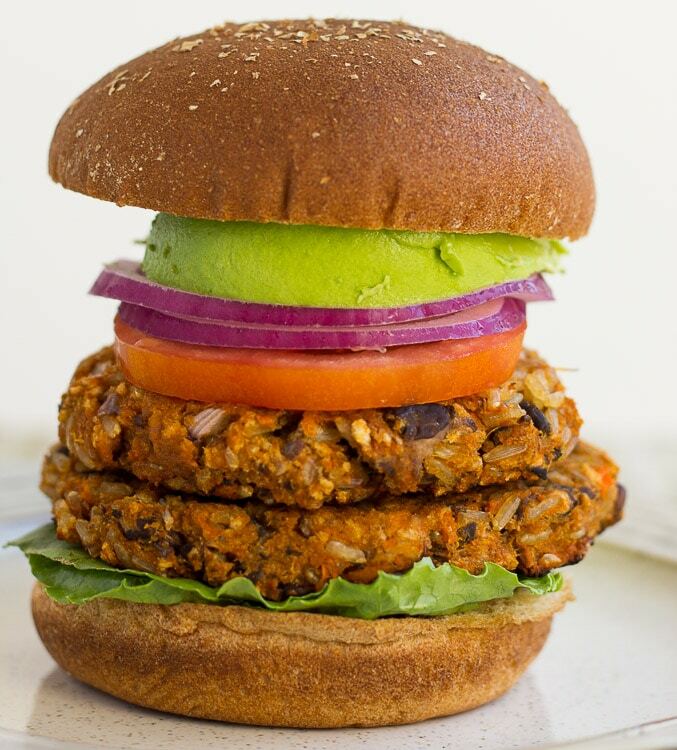 Pictured: Easy Sweet Potato Black Bean Burgers. 4. Eat Oatmeal with fruit for breakfast. 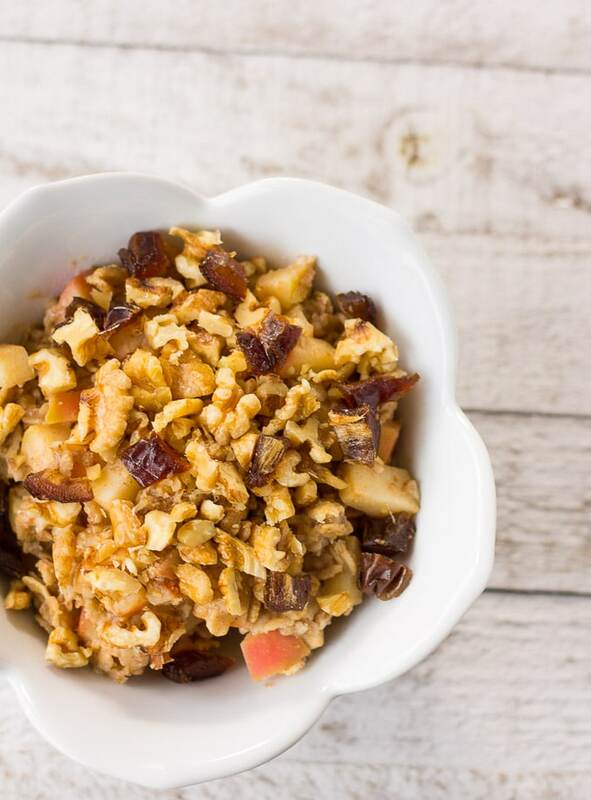 Try 1/2 cup oatmeal with 1 cup almond milk, 1/2 chopped apple and some cinnamon for a delicious apple pie type oatmeal. Oatmeal is not only super good for you, it’s filling, delicious and cheap! Have some oatmeal topped with blueberries and a few chopped walnuts for a simple and easy breakfast. 5. Be thoughtful about the oils you consume. Be aware about how you use oil, even olive oil. The obvious is not to eat fried foods, but also think about oil-laden salad dressings, roasting vegetables/potatoes in gobs of it, and using vegan butter and oil in baked goods. 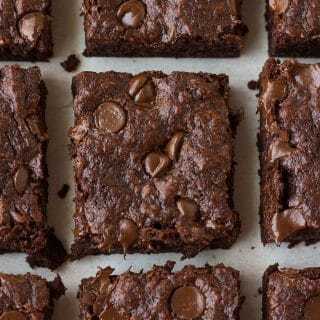 Occasionally, for me at least, it is worth it in a dessert to use earth balance (vegan butter) or oil, but I also have plenty of dessert recipes that are oil-free. If you choose to cut out oil completely, that’s good too! Mostly, I just suggest to be aware and think about how you may reduce your consumption of oils. Make your own salad dressings with no oil; trust me, they taste better than store-bought dressings and are better for you! Try this Vegan Ranch. Some practical tips: Saute in vegetable broth or water instead of oil. 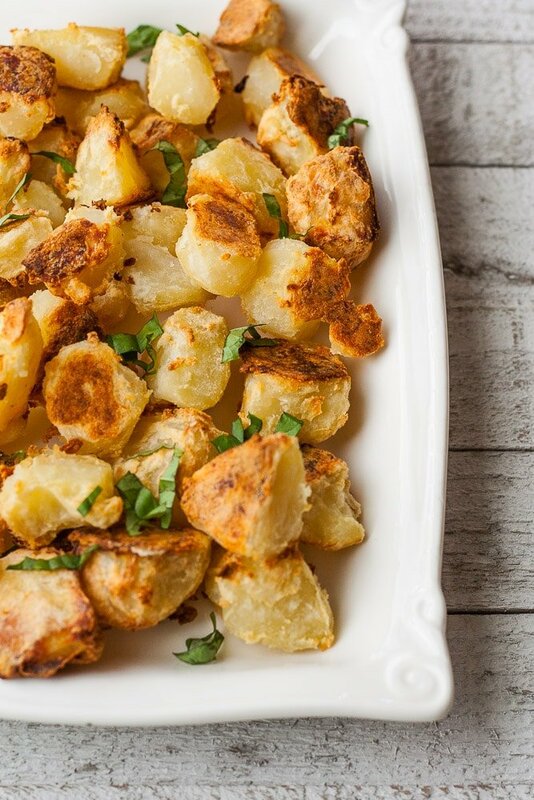 Roast vegetables and potatoes without oil. Try these No-oil Super Crispy Fries. 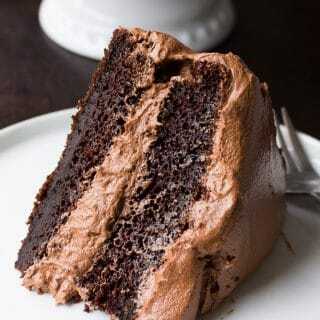 Learn to bake desserts without any oil, like this Chocolate Cake. NOTE: This doesn’t mean you don’t need fat. We need fat in our diet, but it’s better to get it from whole plant food sources, such as avocado, nuts, seeds, tempeh and tofu. 6. Eat a large salad every day. I like romaine, arugula, baby kale or spinach, but the pre-washed lettuce mixes are great, too. Use a good quality balsamic vinegar as your dressing, or try an oil-free dressing. You can make your own, or if you have a Whole Foods around they have a few you can purchase. *My personal favorite is Napa Valley Grand Reserve Balsamic Vinegar. I find it at Whole Foods and other natural grocery stores. It’s so sweet and thick; it makes the perfect dressing in my opinion! *Another quick dressing is the 3-2-1 dressing: 3 tablespoons vinegar, 2 tablespoons mustard of choice and 1 tablespoon pure maple syrup. 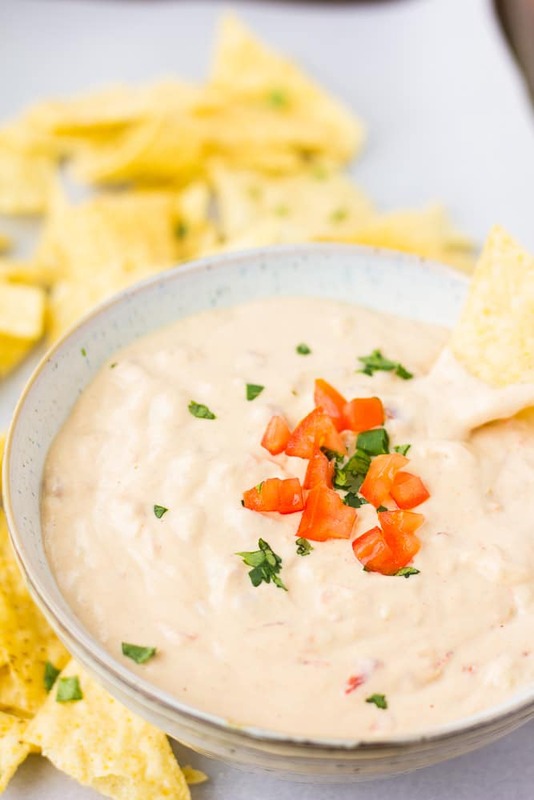 My other favorites: Vegan Ranch Dressing and Lemon Maple Tahini. Add some chopped vegetables such as carrots, cucumbers, tomatoes, peppers, onions, broccoli, etc. Maybe add some beans, especially if the salad will be your main meal. 7. Have a Green Smoothie every day, if it works for you. 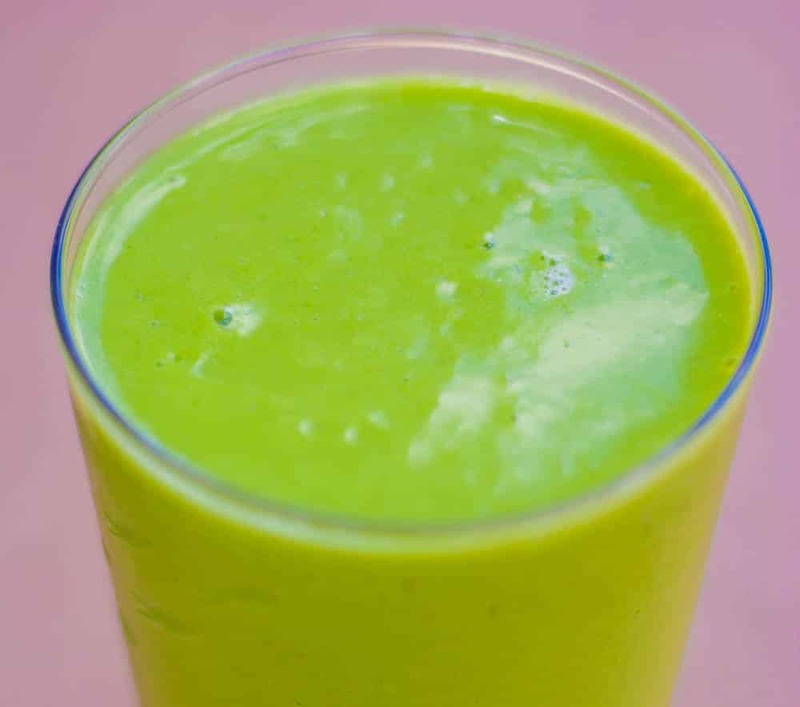 If you have a green smoothie, just try to keep it low in sugar. For the liquid, use water or unsweetened almond milk. Add a lot of greens, a banana and a cup of blueberries. Maybe a tablespoon of flaxseed as well. I like this Tropical Green Smoothie. 8. Eliminate most or all animal products from your diet. Be kind to yourself during the transition, we have all been there. Find new and exciting recipes to try, and explore new flavors and textures. 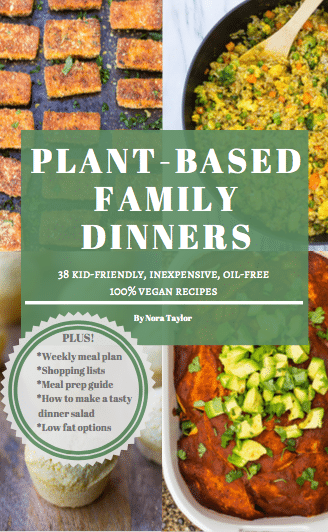 I think you will fall in love with plant-based eating just like I did! 9. Make a meal plan and eat (mostly) at home. Make a plan! Do this at least for dinners for the week, make a list and shop once a week. If you have a plan, and have delicious food to eat throughout the week, you will eat better and save loads of money! Check out my cookbook and meal planning guide here. 10. Have fun! Remember, this isn’t a diet. Diets don’t work long term. This is a lifestyle. If you don’t find joy and abundance in this way of eating, it won’t stick. If you are using a plant-based diet to reach a certain number on a scale, you will likely fail. Celebrate and practice gratitude for all the wonderful food you get to eat! I know some people like to think about food as only fuel, but I think there is more to it than that. We gather as family, friends and community to nourish ourselves and enjoy food. Eating plant-based shouldn’t mean you have to step out of that community. This food is satisfying, not restrictive! I believe food should taste good, which is why I strive to create recipes that anyone would love. Eat when you are hungry. Honor your hunger! We are all in different places in life. I’m still nursing a toddler, and find that I can’t eat just 3 meals a day, I need at least 1 smaller meal or snack to get through the day, sometimes more. Don’t let what you eat cause high levels of stress. Take it easy and slow if you need to while transitioning, and don’t expect that you will always be perfect. You won’t. And that kind of stress is not good for your health and well-being. 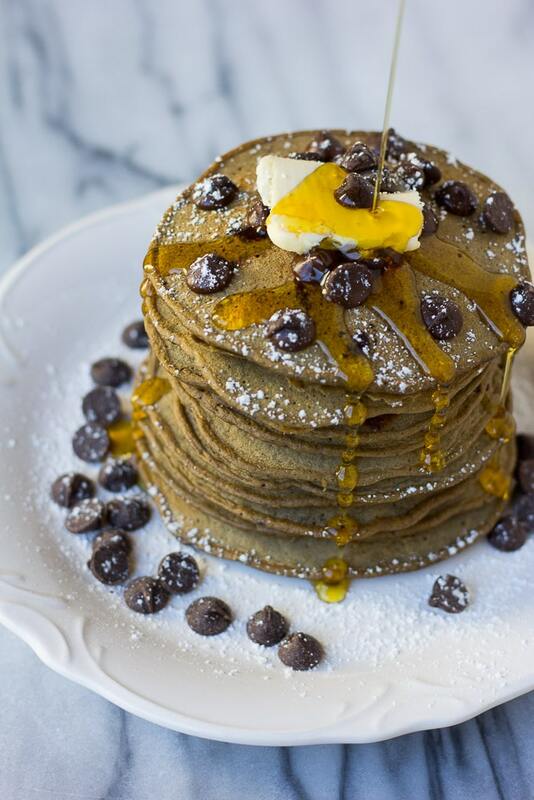 Consider being okay with the occasional indulgence, such as these Double Chocolate Chip Pancakes, or other dessert recipes. 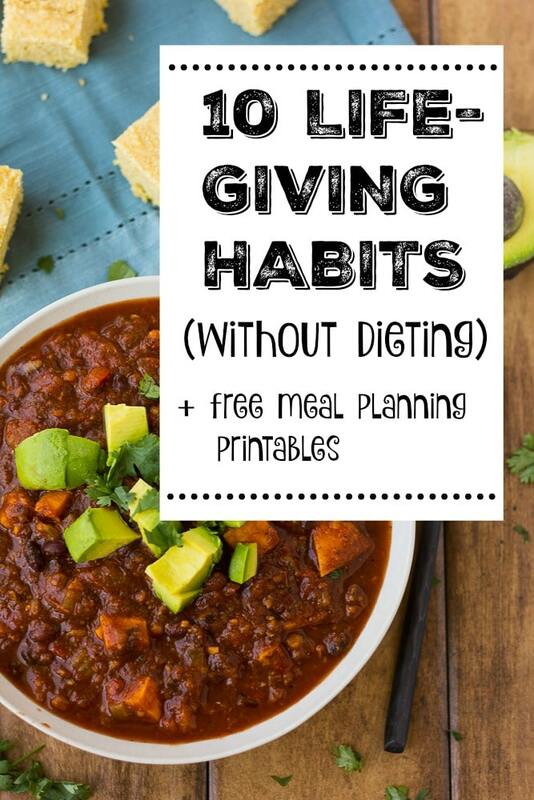 I hope you all enjoyed these 10 Life-Giving Habits! What are some healthy habits you have discovered for yourself?